I’m a sucker for simple games that are quick to learn but challenging enough to keep you occupied for hours on end. Such is the case with Parachute Panic by FDG Entertainment. A Long Way Down: As if jumping out of a plane weren’t perilous enough, you’ve also got to contend with obstacles like flying saucers in Parachute Panic. Your objective in this iPhone and iPod touch game is to safely land the parachutists on passing ships as they fall from planes crossing the top of the screen. You control their descent by swiping your finger in different directions to draw puffs of wind. If someone hasn’t already opened their parachute, tap it to help them with that—earn extra points for giving them a good scare and opening it at the last possible moment. There are lots of dangers as alien spacecraft, passing helicopters and storms try to prevent you from doing your job. Did I mention the waters are shark-infested? Because they are. 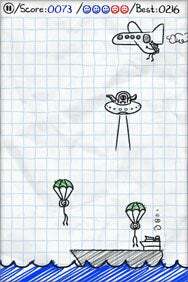 The more parachutists you land, the more points you get. Catch jumping fish for extra points or storks for extra lives, but if you lose five parachutists in the ocean or to any of the other dangers, the game ends. The gameplay is smooth and the action is frantic but what really gives Parachute Panic character is the hand-drawn graphics. The simple stick-figure animations illustrated on graph paper are reminiscent of doodles I once did in school to stay awake in class. The cute animations and great sound effects and music complete the experience to give you a game that is not only fun to play but fun to watch too. There are two difficulty modes, and your statistics are tracked for each mode. New to version 1.2 is a global scoreboard to see how you compare to other players. You can create a buddy list, but there is no Facebook integration—a feature popping up in more and more iPhone games. At just $1, Parachute Panic is a steal, but if you’re want to give it a try, you can download Parachute Panic Lite for free. The lite version lacks difficulty modes, global scoreboard, and statistics of the full version, and the game ends prematurely, but it gives you a good feel for the game. Parachute Panic is compatible with any iPhone or iPod touch running iPhone 2.2.1 or later.